Vietnamese pop sensation Son Tung M-TP has been listed among top 55 Fashion Face Award Year 2016 by I-Magazine. Tung ranked 32th and became the first Vietnamese star who was named in the list. He surpassed many well-known Chinese and Korean artists including Park Hae Jin, Hu Bing, Nam Joo Hyuk, Kang Min Hyuk, Oh Se Hun, and Huo Jian Hua. Korean rapper Lee Gi Kwang took the lead, followed by Hong Kong singer Jackson Wang, and Korean rapper, singer, songwriter and actor Park Chanyeol. This year, jury members included 380 professional photographers, designers, makeup artists, stylists, and editors from the US, Hong Kong, China, and the Republic of Korea. 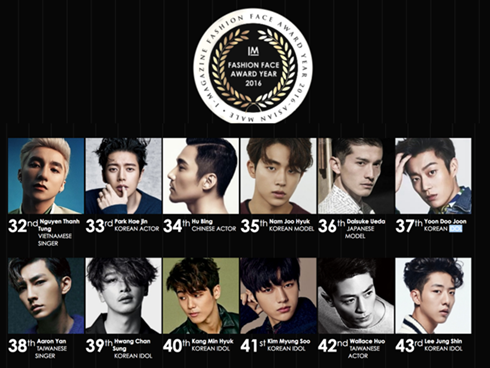 They voted for the top fashion faces in 6 categories from over 35,000 photos and videos.